Mothers Day is one of the biggest opportunities for you to sell products and services and get your diary full. Use this awesome Mothers Day promotion from Salon Management Studio for your email marketing, flyers and print media adverts. Simply use the template following the principles of Direct Response marketing that you were taught at Salon Management Studio’s Marketing Training. Remember to add in your Salon Name, Contact Number and unique pricing. 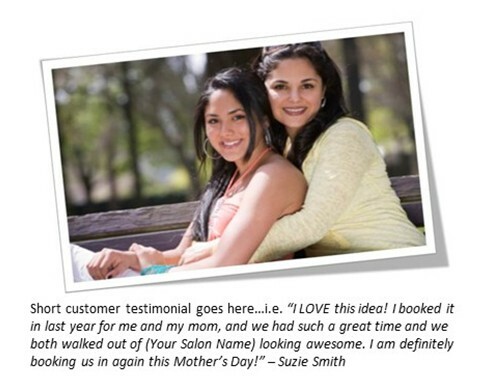 Our Money Back Guarantee: If you and your mom don’t leave our salon feeling recharged and relaxed, we’ll refund your money in full! What do you think about this post? We would love to hear from you. Give us feedback about how yuo used this special offer and how well it worked in your Salon.